21] – On Wed., Jan. 31 from 5:30 to 6:30 PM, be at Free Ahed: Jewish High School Students Speak Out, hosted by IfNotNow DC at the Embassy of Israel, 3514 International Dr. NW, WDC 20008. On Jan. 31, Ahed Tamimi, a 16-year-old Palestinian girl will be put on trial for twelve counts of assault against Israeli soldiers — that day is also her 17th birthday. Ahed was detained after armed soldiers raided her house in the middle of the night, just days after her 15-year-old cousin was shot by an Israeli soldier with a rubber bullet at close range, and had to undergo surgery to remove part of his skull. Multiple Israeli politicians, including Naftali Bennett, have publicly stated that she — as well as her mother and cousin (both detained at the same time as Ahed, though her cousin is now free) — should never be released. Fight back against these extreme threats and show Ahed that the American Jewish community stands with her. Show those who dehumanize Ahed that there is a global movement that will fight until all Palestinian teenagers like Ahed don’t have to spend their childhood facing the brutal reality of the Occupation on a daily basis. No child should have to be subjected to the daily atrocities of the Occupation, let alone the dehumanization of military court and prison. But unfortunately, Ahed is just one of over 300 Palestinian children in Israeli detention facilities. Go to http://www.wherevent.com/detail/IfNotNow-DC-Free-Ahed-Jewish-High-School-Students-Speak-Out. 22] – On Wed., Jan. 31 at 6 PM at 600 5th St. NW at WMATA headquarters, Jackson Graham Building, there will be a WMATA Budget Hearing on FY2019 budget. Join riders and members of Save Our System testifying for a safe, reliable, and affordable public transit system. Meet at 5:30 PM outside to sign up to testify and get an SOS t-shirt. Visit http://www.savemetro.org/. 23] -- On Wed., Jan. 31 from 7 to 8:30 PM, hear a talk by Prof. Richard Wolff – “Beyond the Capitalist Enterprise - The Movement for Worker Co-ops (And What You Can Do! )” The event hosted by Democracy at Work DC will take place at St. Stephen & the Incarnation Episcopal Church, 1525 Newton St. NW, WDC 20010. Find tickets at www.democracyatwork.info. This event is free to the public, however RSVPs are required. Go to http://bit.ly/RDWolffDC to RSVP. Capitalism is failing around the world and what many of us are looking for is the solution, the fix, and a way forward. Dr. Wolff, Professor of Economics Emeritus at the University of Massachusetts, Amherst, and author of many books including “Democracy at Work: A Cure for Capitalism,” will discuss how the movement for Worker Coops represents a way to build a more just and sustainable economy for the future. 24] – On Wed., Jan. 31 from 7 to 9 PM, come to Beth Am Bystander Training, 2501 Eutaw Pl., Baltimore 21217. The Training will be facilitated by CASA. From the termination of DACA to unjust detentions and deportations of our neighbors, this moment requires preparedness to stand with and advocate for our immigrant communities in Baltimore. The Training will include information on immigrants' rights, the current political context, and what YOU can to do as an ally. Go to https://www.facebook.com/events/519197438437813/. 25] –2017 was the second hottest year on record, and had the greatest number of billion-dollar climate disasters in United States history. From Trump’s revival of Keystone XL to climate disasters in Puerto Rico, Houston, Florida, California and beyond, the need for a nationwide climate mobilization has never been greater. As a nation of climate disaster survivors, it’s up to us to bring the polluters and their allied politicians to justice. The Climate Stewards of Greater Annapolis are hosting a Fossil Free Watch Party on Wed., Jan. 31 at 7:30 PM at the Annapolis Friends Meeting House, 351 Dubois Road, Annapolis 21401. RSVP at https://actionnetwork.org/events/climate-stewards-of-greater-annapolis. 26] – On Wed., Jan. 31 at 8 PM, the day after Trump’s first State of the Union, Sen. Bernie Sanders, 350.org co-founder Bill McKibben, Rev. Lennox Yearwood from Hip Hop Caucus, Jacqueline Patterson from the NAACP, Cherri Foytlin from BOLD Louisiana, Varshini Prakash from the Sunrise Movement, and others will unveil a clear roadmap for the movement. The Fossil Free Fast event will take place at George Washington University’s Lisner Auditorium. Hundreds of people from across the D.C. Metro area will be coming together to defend our planetary future against the profiteering of big oil. RSVP to get a ticket at https://gwutickets.com/online/seatSelect.asp?BOset::WSmap::seatmap::performance_ids=1F424896-2189-48BB-B292-278F115EA706. General admission tickets are being offered at a pay-as-you-can sliding scale from $5 to $50. 27] – On Thurs., Feb. 1 from 9 AM to 4 PM get over to TreeTeam Green Up, hosted by Blue Water Baltimore at 2631 Sisson St., Baltimore 21211. Have you ever wondered what it would be like to be a Lorax for a day? Join TreeTeam for this unique one-on-one volunteer experience, where you will learn all about how to properly care for the urban forest. You will work in partnership with expert staff to care for forestry projects all throughout Baltimore City and County. Activities may include pruning, weeding or general beautification. You are welcome to join for a full or half-day experience. All are welcome from the novice to the experienced TreeKeeper! Sign up for the morning shift: https://www.bluewaterbaltimore.org/events/treeteam-green-up_3/ and/or sign up for the afternoon shift: https://www.bluewaterbaltimore.org/events/treeteam-green-up_4/. 28] – There is a Bill Introduction & Rally for 100% Clean Energy on Thurs., Feb. 1 at noon at College Ave,, Annapolis 21401, organized by the Maryland Chapter of the Sierra Club. Contact Veronica Poklemba at ronnie717@comcast.net or 301-277-7111. Join for a rally and press conference to officially introduce the bill that will move Maryland to 100% clean energy! This is the strongest climate bill ever introduced in Annapolis, so we need to show up and show our support. After the rally, stick around to visit your elected officials’ offices and ask them to support the bill! You can get instructions and materials to use. Speakers will include activists and environmental advocates, along with our champions in the legislature. RSVP at https://sierra.secure.force.com/events/details?formcampaignid=7010Z000001P68zQAC. 29] – On Thurs., Feb. 1 at 5:30 PM be at a Courageous Conversations with Bobby Seale, hosted by University of Maryland College of Arts and Humanities at the Orem Alumni Hall, Samuel Riggs IV Alumni Center, 7801 Alumni Drive, College Park 20742. Tickets are available at www.arhu.umd.edu. Hate and bias are persistent global problems. What does it look like to engage in courageous conversations that speak to these difficult realities across personal, political, and historical frames? This year’s UMD College of Arts and Humanities (ARHU) Dean’s Lecture Series (DLS) is an opportunity for the campus to join together for provocative conversations about these issues across disciplines. Join ARHU for the second DLS Courageous Conversations: ARHU Resists Hate & Bias, focused on 'The Historical’, with famed author, founding chairman, and national organizer of the Black Panther Party, Bobby Seale. Mr. Seale will present “Resistance: From the Sixties to Trump,” followed by a book signing and reception. Admission is FREE, but registration is required. RSVP at atgo.umd.edu/seale or email arichers@umd.edu. See https://www.facebook.com/events/127215348082317/. 30] – On Thurs., Feb. 1 from 7 to 9 PM catch a Staged Reading- “There is a Field on Palestine & Black Solidarity,” hosted by Jewish Voice for Peace - DC Metro and Gilda Papoose at the Sandovan Restaurant & Lounge, 4809 Georgia Ave. NW, WDC 20011. Tickets are available at https://goo.gl/forms/Q7E8I2wK1cKdmcf52. Attend this transformational work which leverages theater as a way to engage people outside and within the carceral system, impacted by and bearing witness to police violence, from DC to Palestine, in order to better enable Black and Palestinian people to survive and thrive. This project will bring an infusion of funds to the DMV Black Mama’s bailout and a critical mass of support to the new DC campaign to end the deadly exchange of policing between the US and Israel. Sign up at www.jvpdc.org/deadly-exchange/. “There Is A Field,” written by Jen Marlowe, tells the story of a 17-year old Palestinian boy (and a friend of Jen’s), Aseel Asleh, who was killed by Israeli police. Through Nardeen’s struggle to cope with the murder of her brother, the play offers an intimate view into the daily racism and violence faced by Palestinian citizens of Israel, and contributes to the vital conversation around the systematic devaluation of Black and Brown lives in the United States. With the solidarities and political convictions the play inspires, you can be plugged in to social justice campaigns in D.C. to put an end to the injustices the play exposes. Black women organizers, including this play’s director, Je Nae Taylor, came together to free Black mamas sitting behind bars because they couldn’t afford bail. They fundraised enough in order to bail out 10 mamas on Mother’s Day 2017, and 2 mamas for the March for Black Women, and 1 mama for Thanksgiving. For the Christmas holiday, one of the bailed out mothers gave birth (in freedom, outside the prison walls! ), and they fundraised for her wish list for baby. Visit https://www.facebook.com/events/1301611179985041/. 31] – On Thurs., Feb. 1 at 7:30 PM, tickets $10, $7 MEMBERS (+$3 at the door), see a screening of THE MAN at the Creative Alliance at The Patterson, 3134 Eastern Ave., Baltimore 21224. Email info@creativealliance.org or call 410/276-1651. An African-American senator (played by James Earl Jones) becomes President, after an accident kills the President of the United States. So the first black President attempts to end bigotry. Enjoy a Post-Film Discussion with Clayton Lebouef who is currently developing a feature-length documentary on Rod Serling (screenwriter of "The Man") and Katrina Bell McDonald who holds the title of Associate Professor of Sociology, and is the Co-Director of the Center for Africana Studies, and has served as the Associate Dean of Multicultural at The Johns Hopkins University. 32] – On Thurs., Feb. 1 from 7:30 to 9 PM, see a screening of “The Legacy of Fannie Lou Hamer,” hosted by Friends of the Takoma Park Maryland Library and City of Takoma Park - Municipal Government at the Takoma Park Community Center Auditorium, 7500 Maple Ave., Takoma Park 20912. Hamer was a middle-aged sharecropper living in poverty in Mississippi before she rose up to become a pivotal civil rights activist of the 1960s. She helped organize the 1964 Freedom Rides through Mississippi that culminated with the brutal murders of three activists by a Ku Klux Klan lynch mob, prompting nationwide outrage and renewed support for the civil rights movement. Hamer herself was threatened, arrested and beaten during her work with the Student Nonviolent Coordinating Committee. Robin Hamilton, an Emmy Award-winning broadcast journalist, highlights Hamer’s neglected story in a free screening of her film “This Little Light of Mine: The Legacy of Fannie Lou Hamer.” There is more info about the film at https://www.fannielou.com/. After the film, Hamilton will discuss Hamer’s life and the ongoing fight for civil rights with José Morales, the community engagement and projects director for the National Democratic Redistricting Committee, which works to end gerrymandering across the country. The event is co-sponsored by the Friends of the Takoma Park Maryland. Visit https://www.facebook.com/events/506949036358429/. 33] – On Thurs., Feb. 1 at 7:30 PM at Red Emma's Bookstore Coffeehouse, 30 W. North Ave., Baltimore 21201, turn out for JOHANN HARI PRESENTS "LOST CONNECTIONS UNCOVERING THE REAL CAUSES OF DEPRESSION – AND THE UNEXPECTED SOLUTIONS." From the New York Times bestselling author of “Chasing the Scream: The First and Last Days of the War on Drugs,” a radical new way of thinking about depression and anxiety. Across the world, Hari found social scientists who were uncovering evidence that depression and anxiety are not caused by a chemical imbalance in our brains. In fact, they are largely caused by key problems with the way we live today. Hari´s journey took him from a mind-blowing series of experiments in Baltimore, to an Amish community in Indiana, to an uprising in Berlin. Once he had uncovered nine real causes of depression and anxiety, they led him to scientists who are discovering seven very different solutions – ones that work. Call 443-602-7585. RSVP at http://www.redemmas.org. President Trump moved boldly in his first budget, seeking an additional $54 billion in Pentagon funding for fiscal year 2018. That figure, by the way, equals the entire military budgets of allies like Germany, France, the United Kingdom, and Japan. Then, in a bipartisan stampede, Congress egged on Trump to go even higher, putting forward a defense authorization bill that would raise the Pentagon’s budget by an astonishing $85 billion. (And don’t forget that, last spring, the president and Congress had already tacked an extra $15 billion onto the 2017 Pentagon budget.) The authorization bill for 2018 is essentially just a suggestion, however -- the final figure for this year will be determined later this month, if Congress can come to an agreement on how to boost the caps on domestic and defense spending imposed by the Budget Control Act of 2011. The final number is likely to go far higher than the staggering figure Trump requested last spring. While the full impact of Trump’s proposed Pentagon spending increases won’t be felt until later this year and in 2019, he did make a significant impact last year in his role as arms-dealer-in-chief. Early estimates for 2017 suggest that arms sales approvals in the first year of his administration exceeded the Obama administration’s record in its last year in office -- no mean feat given that President Obama set a record for overseas arms deals during his eight-year tenure. In addition, a congressionally financed study of the best place to base an East Coast missile defense system -- a favorite hobbyhorse of Republicans on the House Armed Services Committee that even the Pentagon has little interest in pursuing -- is scheduled to be released later this year. The Congressional Budget Office already suggests that the price tag for that proposed system would be at least $3.6 billion in its first five years of development. Yet deploying it, as the Union of Concerned Scientists has pointed out, would have little or no value when it comes to protecting the United States from a missile attack. If the project moves ahead, it won’t be the first time Congress has launched a costly, unnecessary spending program that the Pentagon didn’t even request. Cybersecurity has been another expanding focus of concern -- and funding -- in recent years, as groups ranging from the Democratic National Committee to the National Security Agency have been hit by determined hackers. The concern may be justified, but the solution -- throwing billions at the Pentagon and starting a new Cyber Command to press for yet more funding -- is misguided at best. One of the biggest bottlenecks to crafting effective cyber defenses is the lack of personnel with useful and appropriate skills, a long-term problem that short-term infusions of cash will not resolve. In any case, some of the most vulnerable places -- from the power grid to the banking system -- will have to be dealt with by private firms that should be prodded by stricter government regulations, a concept to which Donald Trump seems to be allergic. As it happens, though, creating enforceable government standards turns out to be one of the most important ways of addressing cybersecurity challenges. Copyright 2018 William D. Hartung Reprinted with permission. 25 Jan 2018 – Aung San Suu Kyi’s Social Welfare Minister has declared already that all the burned lands in the region stretching over 100 km (68 miles) are reclaimed by the State. Northern Rakhine region of predominantly Rohingya residents has also been designated as the Special Economic Zone II: Zone I is in the area which were cleared of Rohingya and other Muslim habitation (communities) in the 2012 bouts of large scaled organized ‘mass violence’ backed by the State under Thein Sein’s presidency (2010-15). She has made no attempt to travel across the border j–in fact 30 minutes helicopter ride or 10 minutes boat ride across the boundary Naf River to the vast Rohingya refugee camps in Cox’s Bazaar. Instead she has gone to N. Rakhine State –not with UN investigators or diplomats in Yangon, but with her hand-picked cronies. The world has long been fooled by the true colours of this manufactured Burmese icon of human rights and democracy. 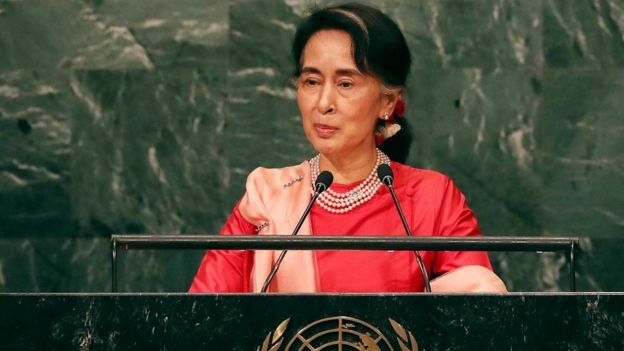 She made her name on the corpses of Burmese democrats who died struggling for a freer Burma, and now she is going to strengthen and deepen her symbiosis with the Burmese cronies and military families which control the Burmese economy, on the mass graves of Rohingyas. We are witnessing nothing short of the emergence of a cold-hearted and immoral Burmese politician. Suu Kyi’s evident priority to turn the killing fields of Western Burma (stretching over 100 KM in length) into a lucrative opportunity for the local cronies who financially support her and her party is utterly morally repugnant. In countries which have a dark history of genocides and crimes against humanity such as Cambodia, Germany and Bosnia, the sites of mass killings and destruction are national or world heritage sites. In sharp contrast, Myanmar State Counsellor is evidently trying to turn the killing fields and mass graves into industrial agricultural projects, mineral exploration, beach resorts and tax-free Special Economic Zone where the Rohingyas who survived the latest bout of slaughter by her father’s army would be allowed to work as cheap labourers for her cronies. Aung San Suu Kyi is not simply “lacking moral leadership” as the US diplomat Bill Richardson put it reportedly, when he resigned yesterday from what he called Aung San Suu Kyi’s (genocide) “white wash” international advisory commission; she is proving herself to be as cold, commercially minded and criminally responsible for the plight of the genocide victims as any past genocidal leader in history, Europe or Asia or elsewhere. She has in fact already taken her favorite cronies and their families on the exploratory tour of parts of these vast killing fields from where over 750,000 fled in a span of 4 months last year. We have seen pictures of smiling Suu Kyi posing with these cronies in these ghostly villages. Lest we forget genocides are not simply one-dimensional racist destruction: economic benefits always accrue the perpetrating. At Auschwitz, Himmler and his men, for instance, were keen on providing German corporations with inmate labourers, as well as commercially motivated “agriculturalists”. The level of callousness this woman displays is beyond not just words, but imagination. \This article originally appeared on Transcend Media Service (TMS) on 29 Jan 2018. Anticopyright: Editorials and articles originated on TMS may be freely reprinted, disseminated, translated and used as background material, provided an acknowledgement and link to the source, TMS: Nobel Peace Laureate Aung San Suu Kyi’s True Colors Shine!, is included. Thank you. Dutch security services watched Russian hackers break into email accounts at the State Department, the White House, and the Democratic National Committee and passed critical intelligence along to U.S. officials between 2014 and 2016, according to a report Thursday in the Dutch news outlets Nieuwsuur and Volkskrant. This intelligence from Dutch security services reportedly prompted the Federal Bureau of Investigations to first look into Russian meddling in the 2016 U.S. presidential election. In the summer of 2014, Dutch AIVD and MIVD intelligence agencies infiltrated computers used by Cozy Bear, one of two state-sponsored Russian hacking operations U.S. intelligence officials believe swiped emails and other documents from the DNC in 2016. Their goal was to influence the general election in favor of President Donald Trump. At the time, Cozy Bear was based out of a university building near Red Square, in Moscow, the outlets reported. Dutch intelligence infiltrated their systems so completely that they were able to capture security footage of the hackers as they entered and exited the room where they worked. Most significantly, the Dutch spies captured footage that proves Cozy Bear operated under the direction of Russia’s Foreign Intelligence Service, according to Volkskrant. The new report cites “six American and Dutch sources who are familiar with the material, but wish to remain anonymous,” according to Volkskrant. Last April, The Washington Post first reported details of a 24-hour pitched battle that occurred in 2014 between the U.S. National Security Agency and Russian hackers who had infiltrated unclassified State Department email systems. “It was hand-to-hand combat,” former NSA Deputy Director Richard Legett told a cyber forum at the Aspen Institute last March, according to The Post. The NSA eventually cut off Cozy Bear’s access to computers at the State Department, according to the reports in both The Post and Volkskrant. But Russian hackers were able to use their brief State Department access to compromise computers systems at the White House, Volkskrant reported Thursday. The relationship between Dutch and U.S. intelligence agencies grew so close, according to Volkskrant, that U.S. officials sent their Dutch counterparts cake and flowers to express their appreciation. In 2016, Rob Bertholee and Pieter Bindt, who headed AIVD and MIVD, met then-Director of National Intelligence James Clapper and outgoing NSA Director Michael Rodgers. That same year, email servers at the Democratic National Committee were infiltrated by Cozy Bear and another group of state-sponsored Russian hackers, Fancy Bear, that acted independently. Those emails would later leak to the online transparency group Wikileaks, which published them as part of what U.S. intelligence agencies believe was a Russian campaign to sway the election toward Trump. Dutch intelligence reportedly passed key intelligence about the DNC hack to U.S. officials. That triggered an ongoing investigation into Russian election meddling by the Federal Bureau of Investigations. At some point, Dutch security services lost access to Cozy Bear’s systems. But they also came to trust their American counterparts less. The Washington Post report from last April attributed the tipoff about the 2014 State Department hack to a “western ally.” That leak upset Dutch officials who felt their American counterparts had betrayed their trust, according to Thursday’s reports. President Donald Trump has also openly praised Russian President Vladimir Putin while criticizing the very U.S. security services the Dutch worked alongside so closely. Trump’s position reportedly made Dutch officials nervous about sharing future intelligence. A spokesperson for Russian President Vladimir Putin, Dmitry Peskov, criticized Thursday’s report. “If the Dutch media want to fuel anti-Russian hysteria in the U.S., it’s an activity that can’t be called honorable,” Peskov told the Associated Press. Joshua Eaton is an investigative reporter at ThinkProgress. His work has also appeared at The Washington Post, The Boston Globe, The Christian Science Monitor, Al Jazeera America, The Intercept, PRI’s The World, and Teen Vogue. Before joining ThinkProgress, Joshua was a digital producer at the New England Center for Investigative Reporting (now The Eye) and WGBH News. ThinkProgress is launching a membership program to help fund our work. If just a small percentage of our readers chip in a few dollars each month, we’ll be able to do more to hold the administration and their allies accountable. Facebook page where you can interact with ThinkProgress writers and editors, talk about your ideas for stories, and connect with each other.